Luxury fashion is a very exciting business which can generate substantial returns if you get the formula right. Not only is there the ability to charge up to ten times the cost of manufacturing a garment and the potential to build a global business; apparel can be the beginning of a page-turning blockbuster, accessories and leather goods are the next chapter, fragrances and eyewear licenses the well-oiled plot. The story can have a happy ending with the promise of many sequels to come. Success stories in this field are mouth-watering: Burberry’s share price climbed from 175p in November 2008 to 1,116p at the beginning of this year as the brand went from strength to strength and reportedly attracted the attention of a number of acquirers. Lanvin has embarked on a stellar growth trajectory with plenty of potential yet to come. However, not all blockbusters have a happy ending. The latest crisis has claimed a number of victims: Christian Lacroix, Gianfranco Ferré, Yohji Yamamoto, Luella Bartley to name a few. In this article we will examine how the traditional designer business model has come under threat and what key factors we believe are necessary to ensure the success of a luxury fashion label today. 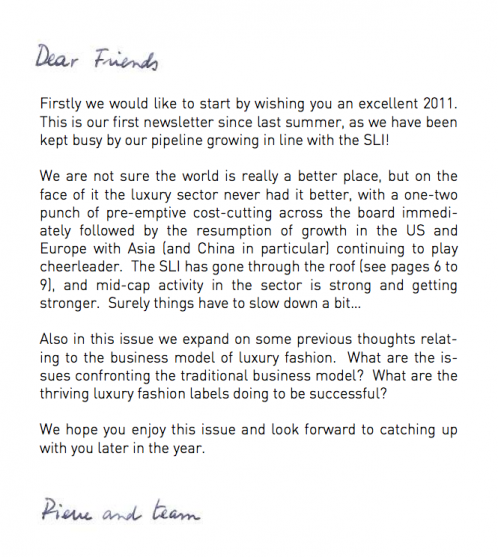 Finally we will take a look at what lies ahead for the luxury fashion sector. Is the designer brand becoming redundant? The traditional designer brand business model is not for the faint-hearted. Typically, a design-rich but loss-making main line is invested in with the aim of capitalising on its cachet through a cash-generative diffusion line and, eventually through lucrative licensing deals. This model not only takes years to generate returns, but the ride is also a bumpy one with no guarantee of success. Christian Lacroix is a prime example of a label which, despite heavy investment in its main line/couture business, never saw the more commercial side of its activities take off sufficiently. Life has also been made more difficult for designer brands, initially by the proliferation of fast fashion brands with a credible fashion offering. Zara, Mango and H&M have been extremely successful at attracting the fashion conscious consumer by interpreting catwalk trends with a time to market that would make Philip Green’s head spin. H&M took this one step further by pioneering designer collaborations, which created veritable stampedes in its stores and brought new customers to the brand. Top Shop has also been a trailblazer in this category: the brand showcases its Unique collection at London Fashion Week, its collaboration with Kate Moss has given it an edge and its recent opening of a flagship opposite Harrods demonstrates that it is looking beyond its traditional high street pasture. And finally, traditional designer labels have been challenged by – and sometimes losing ground to, contemporary brands which offer a more accessibly-priced, less fussy fashion product. In this category both a Phillip Lim, who designs his eponymous line to a price point whilst still being able to fully express himself, and a Tory Burch, with a very-well merchandised line sourced mainly out of China, have found their audience in a relatively short time and have created thriving, financially successful businesses. It is telling that Narciso Rodriguez and Hussein Chalayan both saw their brand being returned to them by their investors, and that such a star designer as Hedi Slimane is still without a major job in the industry. What lies ahead for top designers? Below we examine some of the strategies that are allowing some known fashion brands to not only survive but to prosper. Designer labels have taken major steps to reduce seasonality risk by complementing their Spring/Summer and Autumn/Winter collections with pre-collections, cruise and pre-fall collections, thus increasing the number of collections from two to up to six per year. These inter-seasonal collections tend to contain more commercial pieces than the main collections, often have more accessible price points and now account for the bulk of sales of a fashion brand. This is also music to retailers’ ears whose aim it is to get fresh stock into stores, so as to give customers a reason to come back, and shift the stock as quickly as possible. Some luxury brands have taken a leaf out of the book of leading fast fashion players such as Inditex, introducing flash collections in their stores. The well-publicised demise of the Gianfranco Ferré fashion house exemplifies the need for a strong merchandising function: during the early noughties development costs for its main line collection escalated to Eur5m per season, and the number of pieces produced for market stretched as far as the eye could see. The first actions of the newly-appointed CEO upon taking over the troubled company was to control collection development costs by significantly reducing the number of SKUs, the number of styles produced and of prints ordered, and to make sure that each style was able to generate profits on relatively small sales volumes. There the model was clearly in need of an urgent fix, but on an ongoing basis the role of the merchandising team, working with the design and product teams on one hand and the marketing and sales teams on the other, harnessing the creative talent and editing down the creative output to what will work or generally help the band, is absolutely critical. This helps to ensure that the market reception of the collection will be as good as possible, but is also true – and increasingly importantly so – in a world where the number of deliveries has increased and where efficient re-ordering and replenishment is where the real money is made. Whilst every management team in the industry dreams about creating that iconic product or series of products which will become a cash cow, over-dependency can prove a curse if you push this too far and the market turns on you. This famously happened to French Connection, which rode the FCUK bike from 2001 until the wheels came off, resulting in the company dipping into loss for the first time in fourteen years in the first half of 2007 (the group is now rapidly recovering under the watchful eye of its Chairman & CEO, Stephen Marks). A good example of what to do is Mulberry, for which its iconic Bayswater bag is surely a large part of its turnover but which has been very careful to broaden its appeal by successfully working on its brand image and presenting a fairly broad RTW offering. Another interesting path is that of Burberry, which initially had to rely too much on the dual deities of trench and check but made a considerable effort to diversify its product portfolio so as to avoid being branded as a one-horse pony, and on top of that successfully fended off the chav issue (to be reviewed in detail in a forthcoming issue of our newsletter). Invest in retail but focus on the detail! The last crisis claimed a lot of casualties as a result of over-dependence on the wholesale channel. Pain was felt in two areas: small boutiques not paying up on their orders, or proving to be too much of a credit risk going forward, and department stores panicking and batting down the hatches. Many fashion wholesale businesses were thus caught with their pants down and had nowhere to shift their rapidly devaluing stock. At the other end, whilst the experience for retail-led fashion brands was not by any means pleasant, the effects of the crisis were less hard felt. In this respect wholesale activities played for the fashion industry the same role as leverage did relative to the financial world: it can significantly enhance returns and offers easy growth, but when the market turns, the ground is taken away from under your feet. Beyond this point, retail presence offers a number of advantages. First and foremost the ability to capture the retail margin – a fully-integrated fashion retail business can generate gross margins up to 80% (and sometimes more! ), as compared with a wholesale business margin of 40 to 50%. Retail presence also allows for more control of the brand image and presentation. This is particularly important as a brand evolves as it can often get stuck in a time warp, with retail buyers ordering variations on what sold well in the last season instead of following with new products/designs, often seen as more risky. Whilst location is key, store size is also vital to driving store economics. The late 1990’s saw the proliferation of mega-stores as shrines to brands. Many of these were loss-making: those of you who spend time in London will remember the monolithic Jil Sander store on Burlington Gardens, intimidating by its emptiness. When Change Capital Partners took over the company, its losses were well into double-digit millions. One of the first steps the new owners took was to close a few of its most unprofitable stores – the infamous London flagship for instance was relocated to a smaller premise on Bond Street. Losses were drastically reduced, and within a year the company was profitable. White elephants such as this previous Jil Sander store never made good retail propositions, but you could understand why some management teams were keen on them: retail really helps drive wholesale. Department store managers will never own up to it, and we are sure Barneys and Bergdorf top brass were horrified when Lanvin announced the opening of its Madison Avenue store in the summer last year, but over time (and more quickly than people think), whatever turnover is temporarily lost for the neighbouring department stores will be made up and more, as the brand benefits from increased awareness, more prestige and a stronger, more complete image as a result of its own retail presentation. So, own retail is most definitely good – as long as you can properly evaluate its cost / reward assumptions and avoid the white elephant trap. Fashion is a uniquely complex business. The supplier base is increasingly global and increasingly specialised: there is therefore no guarantee a brand will be sourcing its product from the same country, let alone the same supplier, season after season. Distribution can be equally complex, the challenge of a global distribution network being compounded by an often fragmented customer base. The fashion business model is also very sensitive to production volumes; thus the supply chain has to be continually revisited during the growth phase of a brand. One of the cornerstones of Burberry’s success has been the investment in its supply chain. Project Atlas, an overhaul of the company’s supply chain and IT systems, was launched in 2006, culminating in the rollout of global SAP systems in 2010. This has given it a much improved granular understanding of every phase from design to the consumer, allowing the company to react rapidly to sales trends and capitalise on bestsellers. Burberry completely re-engineered its supply chain, cutting the number of distribution centres, freight carriers and suppliers and, through improved production planning, significantly reduced the use of air freight in favour of cheaper sea freight. These measures were estimated to deliver approximately £25m in annual savings, or 14% of operating profit. As a result of these measures the company can now also give fast fashion a run for its money through dramatically shortened times to market. A future dominated by men and computers? Besides the well-documented potential in China and other emerging markets, two areas of growth merit our attention: menswear and the internet. Despite continuing success stories such as Lanvin’s, womenswear is pretty much a saturated segment in developed markets and therefore very competitive. On the other hand the men’s market accounts for a relatively much bigger slice of the luxury pie in emerging markets. Men are notoriously difficult to attract to a brand, but as a result also tend to be very brand loyal. There are also less cultural/sartorial differences across borders in menswear than there are in womenswear. All of these characteristics make this segment worth the chase, even if traditional menswear players have to alter their offering to give more room to sportswear and casual styles, away from suiting (suits are simply worn less in emerging markets). The potential of the internet has yet to be fully harnessed by luxury fashion players. Richemont’s recent investment in Net-à-Porter (and the valuation the investment commanded) confirms the perceived potential of this medium. Burberry is ahead of the curve in this category – its Facebook page has the largest following of any luxury brand, its social media website www.artofthetrench.com is streets ahead of competition and it was the first brand to sell runway items from its Autumn/Winter 2010 show direct from the webcast to consumers. The potential for volume and margin in this area is huge – the only cloud on the horizon being the high level of returns (around 40%) creating a working capital headache. The designer brand model in its purest sense has probably had its heyday. However, just as we thought we’d never see shoulder pads again when Joan Collins’ flamboyant character Alexis Colby left our screens, with a few alterations here and there they are back with vengeance. We should expect no less from the designer fashion business. Leaving 2007 in the dust! The SLI has had a stellar 2010, smashing through the 2007 ceiling and finishing 32% above its then all-time historical high. A good start in the first half, with gains of 22%, evolved into a year-long rally with the SLI gaining an overall 60% since January 2010. Underpinning this outperformance of 33% vs. the MSCI has been a heady combination of strong top line growth across the sector, continued benefits of cost control measures introduced during the crisis and a fair amount of bid speculation. 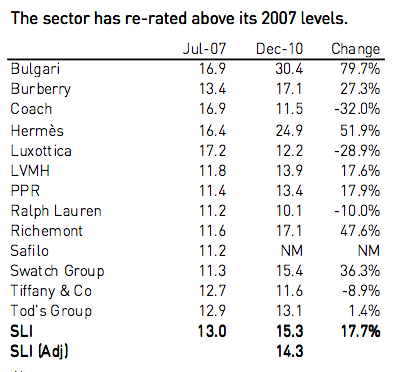 Luxury groups were almost as surprised at the quick turnaround of fortunes as they were with the rapid downturn in 2008/9. Whilst Asia has always remained robust and is now the principal engine of growth for many groups, Europe and especially America are faring well. Consumption of high ticket items in the developed markets is being fuelled by a surge in corporate profits, bonuses and growth in business travel, all of which benefit the higher echelons of society. Nevertheless, the recent economic crisis has resulted in a profound shift in global dynamics. China is now the second largest luxury goods market in the world and new luxury hubs are opening up in South East Asia. Having battened down the hatches in 2009, department stores (especially in the US) went on a shopping spree in the first half of 2010 to replenish depleted shelves. Wholesale orders have continued to come in during the second half, relegating concerns that the surge in income from this channel at the beginning of the year was a one-off. Bid speculation has returned to the sector with a vengeance this year. In the case of Hermès, there was no smoke without fire, with LVMH disclosing a 17.1% stake in the legendary saddlemaker on 25 October. Burberry has also been the subject of bid speculation, initially associated to PPR and more recently to a consortium of Chinese investors as well as Richemont. This has contributed to the meteoric rise of the company’s share price from 175p in November 2008 to £11.50 in early December. Bankers are getting bonuses and businessmen are flocking to airport lounges again; however in most of the developed world unemployment is rising and inflation combined with further public sector cuts are going to put even more pressure on people’s wallets. The situation is worsened by the scarcity of available credit and a glum property market, raising the question as to how sustainable this one-legged recovery is. 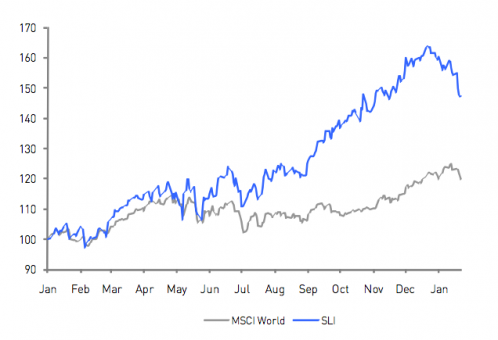 One of the strongest recovery stories in 2010 has been the Swiss watch sector. This recovery may get hurt if the current surge of the Swiss Franc continues. Swatch for instance generates 50% of its sales in Dollars and estimates that a 1 centime appreciation of the Swiss Franc to the Dollar rate wipes CHF28m off group sales. More of concern is the fragility of the Euro. Whilst a weak Euro may benefit European luxury goods players in the short term, the currency has received some real knocks this year, initially from Greece and most recently from Ireland. With its credibility almost at stake, 2011 may prove to be a rocky ride for the adolescent currency. 2010 will undoubtedly have been an exceptional growth year for the luxury goods industry. Luxury players have held back from pronouncing themselves for 2011 until recently: the overall view is that 2011 will be a good year, but not as strong as 2010. This seems to be echoed by recent stock market valuations, with the share price of leading component companies of the SLI having eased off in January. Some analysts we spoke to talked of profit-taking by professional investors in light of uncertainty over the pace of continued growth in China. On the face of it, the SLI EBITDA multiple appears to be well above the peaks reached in 2007. However, several stocks have abnormal multiples: obviously Safilo, due to its negative earnings, but also Bulgari which has had to clean up its act, notably after an unsuccessful foray into accessories retail, and has seen recent earnings severely depressed. 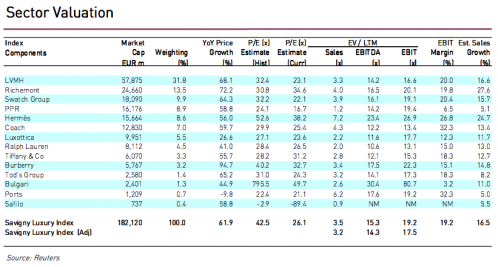 At the other end of the spectrum, Hermès’ EBITDA multiple continues to be inflated by bid speculation at nearly 25x. Stripping out these three component companies, the current SLI EBITDA average (computed on a weighted average basis, taking into account the relative market capitalisation of each company) stands at 14.3x. This is still 10% ahead of the 13x EBITDA multiple which prevailed in the sector in July 2007. This newsletter is distributed from time to time to clients and contacts of Savigny Partners LLP (“Savigny”) who are interested and professionally experienced in the luxury goods sector. The views and opinions expressed in this newsletter pertain to themes that are topical to the luxury goods sector as at the date of this newsletter, and are meant to stimulate open discussion between Savigny and its clients and contacts. The information in this newsletter has been compiled from sources believed to be reliable but neither Savigny, nor any of its partners, officers or employees makes any representations as to its completeness or accuracy. This newsletter is not intended to help its addressees or readers make investment decisions, nor does it purport to make recommendations regarding potential investment decisions. Savigny shall not be liable or responsible for any loss or damage caused by or arising from any reader’s reliance on information contained in this newsletter. Please note that some or all of the brands, and the companies which own brands, mentioned in this newsletter may have been and may continue to be clients of Savigny or may have a professional relationship with Savigny.